Thank you to Little Brown for sending me this book via Netgalley in exchange for an honest review. In 1952 two young lovers meet, in secret, at the beautiful Southern Cross theatre in the very heart of London's West End. Their relationship is made up of clandestine meetings and stolen moments because there is someone who will make them suffer if he discovers she is no longer 'his'. But life in the theatre doesn't always go according to plan and tragedy and heartache are waiting in the wings for all the players . . . It's safe to say that I am a big fan of Carrie Hope Fletcher and probably always will be. Since she started releasing novels my love for her has grown and when I managed to get myself a copy of her latest book When The Curtain Falls, excitement was an understatement of what I was feeling. In 1952 at the beautiful Southern Cross theatre in London's West End two young lovers meet, in secret. Their romance is made up of stolen moments and illicit moments because there is someone who could make them suffer if they find out she is no longer 'his'. Life in the theatre doesn't always go to plan and tragedy is waiting in the wings for all. Seventy years on a new production of When The Curtain Falls arrives at the very same theatre, bringing with it Oscar Bright and Olive Green along with their blossoming romance. Soon strange things begin to happen and they learn about a ghost that has haunted the theatre since 1952 and who can only be seen on one night of the year. Except the ghost is appearing more often and seems set on sabotaging Oscar and Olive's romance. Despite it starting off rather slow, I ended up become hooked on When The Curtain Falls and it's entrancing plot. It has the magical feel that all of Carrie's previous novels had and I just didn't want to put it down. It was truly spellbinding. If you know Carrie's writing style already, you will definitely love this. The time jump from 1952 to the present day was the thing that I enjoyed the most. Time jumps within novels is something that I am intrigued by so I am glad this was in When The Curtain Falls. As someone who has a big interest in 1950's, I'll admit I loved those segments a teeny bit more, thats not to say I didn't like the modern day segments, I can assure you I did! Carrie's knowledge and experience of working within the theatre industry most certainly shone throughout this book. You could feel the passion she has for theatre through her writing and it was honestly a joy to read. I feel that this is the book that she had the most fun writing. It also feels like her most personal piece of fiction to date. The two female protagonists also felt like they had elements of Carrie's personality which in my opinion made me connect to them more. The setting within a west end theatre was just stunning! As a big lover of the theatre myself it was just amazing to read a book set in primarily that background. Each description given was so vivid and it almost felt like you were there, watching the show yourself. It was truly spellbinding. Each character within When The Curtain Falls had their own special personality and each shone through. I felt like I bonded with each of the protagonists almost instantly and this in turn helped me to fall in love with each one. Fawn and Walter and Oscar and Olive were all such incredibly intriguing, likeable characters and reading about their lives was just outstanding. Although this is a magical, romantic read I will just mention a few trigger warnings. When The Curtain Falls does touch on the topics of domestic abuse, emotional abuse and sexual abuse. This was quite shocking, as I wasn't expecting it but it was dealt with in a exceptional way. Nothing was glamourised and I commend Carrie for bringing focus to such issues. 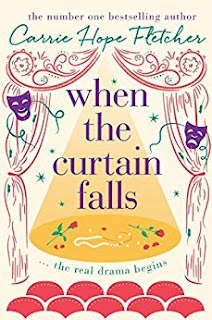 When The Curtain Falls was an enchanting, mesmerising, miraculous read. This is Carrie's third novel and I honestly think she gets better with each one she writes. I am eagerly waiting to find out what she writes next.